Ex Chief Minister H.D.Kumara Swamy began his election canvass in his home constituency Ramanagara after offering his prayers to the village diety in Kempanahalli in Kasaba Hobli. Because of the strict election code of conduct he was accompanied with very few members from his party. 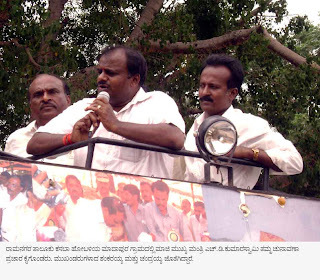 Later in the day he addressed voters at Madapura, Sugganahalli.